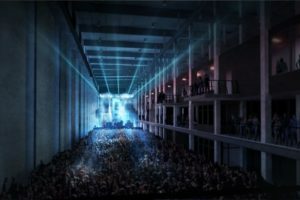 Printworks is expanding its London empire by opening a new live music venue. The 3000-capacity space will be in the same building as the current club and Broadwick Live, the company spearheading the project, says the new venue will lean on the heritage of the building, with high ceilings and painting presses as the backdrop. During the week the new venue will host live music, but the weekends will be saved purely for the electronic music programme, of which Kerri Chandler, Job Jobse and Lindstrøm are locked in for on March 3. However, Friday nights will alternate between live gigs and parties. The production company plans to create a scene that both live bands and DJs will want to play in. Django Django is the first show announced for March 23, with more acts set to be confirmed. An arts and culture programme will also be hosted at the new spot, headed up by Tasmin Ace of the Southbank Centre. Broadwick Live is behind festivals such as Snowbombing, Field Day and Festival No. 6. The image above shows an artist impression of the venue, and the one below shows the work in progress. Read our piece on how Printworks became the saviour London desperately needed.